Arcturus is the bright, reddish star which can be seen during the summer months, currently, at an altitude of about 40° (or, about 4 fist-widths) from the western horizon at sunset, and from about sunset until around 2:00am, when it sets below the western horizon. Arcturus is the brightest star in the constellation, Bootes - the 'herdsman'; the brightest star in the northern celestial hemisphere, and the fourth brightest star in the skies of Earth. Its name comes from the ancient Greek, meaning, "Guardian of the Bear"; Arcturus appears to be trailing the constellations, Ursa Major and Ursa Minor (the 'Great Bear', and the 'Little Bear', respectively). It can easily be located by following the arc of the handle of the Big Dipper, just out into the nearby, celestial blackness - just remember: "Arc, to Arcturus"; and, there Arcturus sits, alone. This 'red-giant' star, is about the same mass as our Sun, but it is nearly 200 times more luminous. This is because of its enormous size, with a diameter of 22,000,000 miles. Our Sun, "Sol", currently, has an average diameter of 864,000 miles, making Arcturus nearly 26 times the size of the sun, but - it is also 217,000,000,000,000 (217 trillion) miles from Earth, or about 37 light-years distant, accounting for its apparent, relative diminution to our sun. Arcturus is near twice as old as our Sol, at around 7.1 billion years. Red giant stars are stars that are in the later stages of stellar evolution: briefly, they have exhausted their supply of the fuel that sustains them at their cores - Hydrogen. They are still consuming the remaining H in their outermost, gaseous shells by thermonuclear fusion, but have lost so much of their original mass that their surface temperature drops, significantly, and they become so, "swollen", that their remaining 'bulk' is gradually extended into the surrounding space. One day, about 4.5 billion years from now, our own Sun, currently a yellow-dwarf star on the Main Sequence Diagram of Stellar Evolution (also called the Hertzprung-Russell Diagram), will begin its final journey through the red giant phase, as its own nuclear furnace starts to cool down, to begin the journey to its final state - a tiny, hot star, known as a white dwarf. Though Arcturus is 37 light-years away from our Solar system, its relatively feeble light output was used as a switch, to turn on the lights at the Chicago World's Fair, in 1933, by converting that radiation, using a photoelectric-effect process, combined with a telescope, into electrical signals and, thereby, 'tripping the switch' that turned on the lights at that fair! Though this trick could have been accomplished using almost any other sufficiently bright star, Arcturus was chosen, for the fact that its light takes almost 40 years to travel the distance to Earth, through space, and, the last time that the World's Fair was held in Chicago, was 40 years prior. But, how do we know, that, our old pal, Arcturus is actually a 'rogue visitor', from some other, far-off galaxy? It's because Arcturus orbits our Milky Way galaxy at an oblique angle, almost exactly perpendicular to the plane of rotation of most of the other stars of the galaxy. This means that it doesn't carry the same angular momentum or velocity (speed and direction) of the majority of stars, native to the Milky Way. And, there's more. Lots more. Our galaxy - a fairly typical, the barred-spiral galaxy is, actually, an aggregate of a small "collection" of once, separate, individual galaxies! You see, galaxies move through the universe in clusters, which are gravitationally bound to a common center of gravity, created by an original mass - say, a hypothetical, binary galactic pair. Since all matter in the universe is gravitationally attracted to all other matter, the original, revolving pair, would soon have given in to the increasing 'force' of gravity generated by the pairs' decaying orbits, and, eventually collapsed together to form what we currently know as the Milky Way galaxy. (There may be other ways for stars to wind up as 'intergalactic rogues', such as, by gravitational sling-shot-ing, but it doesn't seem to be the case, here). 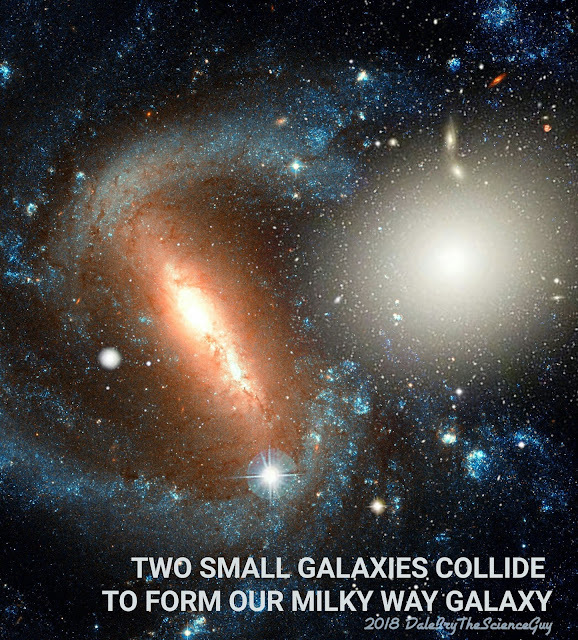 But each galaxy of the original, binary pair would have possessed its own, specific inertia, as well as, specific mass, and a specific plane of rotation, bisected by a specific axis of rotation. During the merger, most of the stars from both member galaxies would, over time, have assumed a common motion about the now-merged, galactic cores. But some stars, being farther away into the outer periphery of either galaxy, would have strayed, slightly, due to the effects of the differences of the combined angular momentums of the pair, and assumed their own orbits about the galactic core - as did Arcturus - along with 50 other known, stray stellar masses! These 51 stars are known as the "Arcturus Stream". Other such streams are thought to exist, but these are so distant, relative to the Arcturus Stream, that they remain undetected. Nevertheless, our Milky Way galaxy - our 'home' galaxy - has adopted these intergalactic wanderers as its own, which, is just as it should be, in my opinion, and I'm O.K. with Arcturus (much like, myself, in a way), as one of good ol' Sol's, 'intra'-galactic, adopted brothers!